Jerusalem - An American rabbinical student studying in Israel is suing a Jerusalem pizzeria for refusing to serve him due to his sexual orientation. 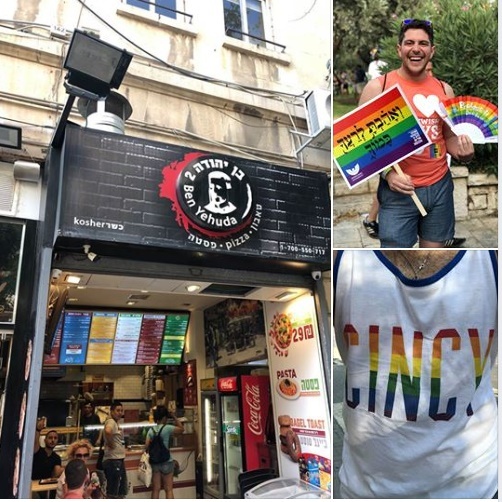 Sammy Kanter, who is studying at the Reform movement’s Hebrew Union College in Israel for the year, was wearing a gay pride T-shirt in early August, a day after the Jerusalem Pride March, when he and some friends entered the Ben Yehudah 2 pizzeria. The white T-shirt had rainbow letters that spelled out “Cincy,” his hometown of Cincinnati, Ohio. Refusing customers service because of their sexual orientation is illegal in Israel. Kanter filed a lawsuit the following month, seeking damages of 33,500 shekels, or about $9,100, with the assistance of the Israel Religious Action Center, or IRAC, the social justice arm of the Reform movement in Israel. The owner of the pizzeria initially told Israeli media that, if the incident occurred as Kanter had said, he would fire the employee. He later backpedaled, saying it was probably a misunderstanding as the employee was trying to close the shop and get it cleaned up before the start of Shabbat. Sattath said the pizzeria owner refused to negotiate outside of court after being advised of the law. “Sammy is not interested in the money for himself. He is interested in the precedent,” Sattath said. He has, in fact, suggested that any award be donated to Jerusalem organizations that support LGBT rights. The case is scheduled to be heard in Jerusalem Small Claims Court on Jan. 31, 2018. Kanter will represent himself. He is scheduled to remain in Israel through the end of the school year. You post this as a rabbinical student? Just what Yidden need another gay FAKE "rabbi" what will they call his spouse "Rabbit"? not to worry his smicha isn't worth the paper it is written on. Looks like he was kicked out for obscenely gawdy apparel. Even a pzzeria has standards. I guess his hearing was already - says scheduled for Jan 2018. He can't be rabbi if he's going to reform school. He doesn't keep the Torah if he is gay. Have you ever walked into a pizza shop on Ben Yehuda Street? For that matter, any pizza shop in Israel? I prefer to only hint that you and I wouldn't have been insulted! "He" clearly was advised to start the pizza shop version of WOW ladies. Avraham Avinu accepted all guest but that was his private residence. There are families going to the pizza shop with children who don't want their kids exposed to abominations. Strange story. They sell pizza to everybody. "Israel Religious Action Center, or IRAC, the social justice arm of the Reform movement in Israel." “ "Israel Religious Action Center, or IRAC, the social justice arm of the Reform movement in Israel." So TURE, but so sad! Wow, lovely comments. So if one of your kids tells you he is gay, what will you do? Never talk too him again and pretend he never existed so that your life becomes perfect again? 3-5% of the population are gay. One in 25. That's how they were created. And you wonder why they kill themselves. All a big misunderstanding. He told him "gay arois." The future rabie didn't understand yiddish. This guy is a fake troublemaker. Have any of you seen the weirdos on Ben Yehuda every day? I don't believe the story, I think this is a gay activist who wants to raise awareness (we are all aware enough, thank you very much) and cause trouble. I feel sorry for the owner. But let's play pretend and say it's true. The EMPLOYEE was wrong. Not the owner, so why sue him? Oh because at minimum wage the pizza guy doesn't have money. Classic shakedown. he is a rabbinical student in the Yeshiva of Sodom and Gemorrah and plans to spread their torah of HIV and AIDS all over the world! I agree. Seems strange some pizza guy is the keeper of public morality. I compliment the pizza shop owner for throwing the faygaleh out; the straight population is sick and tired, of having their deviant life style constantly thrown in our faces. This may difficult for some people to accept, but it is a scientific fact that some people are born gay and some are not. Gay people just want to live their life. Before criticizing anyone who is different from you, try perfecting your own life. Maybe start off by not making nasty and hurtful comments on the Voz Is Neis website. If my own child told me he was gay, I'd treat him like any other off the derech kid. Love him but don't condone him. Get him into therapy. If the Torah says it's an abomination, then it's a sin like eating treif or not keeping Shabbos. Loving your child doesn't mean accepting that he is sinning. Speak to a Rov about what to do with him. this si the pshat 'kenimrod gibor tzeid lifney hashem"
“ This may difficult for some people to accept, but it is a scientific fact that some people are born gay and some are not. Gay people just want to live their life. amd dont tell us gay peple want to live thier life!..so why advertising it on shirts, parades. why dont mchalleley shabbos m etc make mechallelay shanbbos parades, betality parades ... this is pure l'hachis to 'spit' in gods face.